MTA project leader Janno Lieber said the upgrades will go a long way toward making the commutes of more than 200,000 Long Island Rail Road riders more "humane." Long Island Rail Road commuters are closer to a brighter, more spacious and easily accessible Penn Station now that the Metropolitan Transportation Authority board has approved a $600 million modernization project officials say will transform the station’s cramped LIRR concourse into a “world-class” transit hub. The project, which MTA officials hope to break ground on this year, will widen walkways, raise the ceiling and add escalators leading from the railroad’s main customer concourse directly to Seventh Avenue, via a new entrance and exit pavilion with a view of the Empire State Building. Proposed by Gov. Andrew M. Cuomo and Empire State Development Corp. about three years ago as part of a broader plan to expand Penn Station, the effort to spruce up the LIRR’s piece of Penn took a major step last month when the MTA board approved its financing. Under the agreement, the LIRR is paying $170 million from its existing 2015-19 Capital Program, and the state is funding the balance, about $430 million. “The transformation of Penn Station has been talked about for decades, but no one ever got anything done, which is why last year we announced a plan to address the station’s outdated, inefficient and potentially hazardous conditions," Cuomo said in a statement. One of the key aspects of the plan will see the main east-west corridor in Penn’s LIRR concourse nearly doubled in width, from the existing 30 feet to 57 feet. Under an agreement with Penn’s main retail property owner, Vornado Realty Trust, storefronts along the walkway will be pushed back by 20 feet to help free up more pedestrian space. In addition to becoming wider, the corridor will become taller, as the project calls for the ceiling to be raised by an average of 10 feet. And, at the eastern end of the walkway, near the existing LIRR ticket windows, a hole will be punched through the ceiling to allow for three new escalators and a new staircase that will lead to Seventh Avenue. The new entrance and exit will be designed to allow natural light down into the gloomy station, and also will provide much-needed additional exits in case of an emergency. Officials said the project is necessary to address the booming ridership at Penn Station, through which 650,000 customers travel each day, using the LIRR, Amtrak, NJ Transit and six different subway lines. And Amtrak, which owns the station, recently approved a deal with the MTA that will allow the LIRR’s sister railroad, Metro North, to begin running trains to and from Penn in about five years. LIRR commuter Norman Goldberg, of Cedarhurst, welcomed the prospect of more breathing room at the station. Other improvements are also on the way, including glass walls that will allow travelers to look down onto the track level from the main concourse, improved lighting and signs to help customers find their way around the confusing station, and digital information screens inside Penn’s retail establishments that will provide information to commuters while they are shopping and dining. Organizers still need to work with Amtrak, which owns Penn Station, to finalize a design for the project. Janet Campbell-Lorenc, Senior Director of Amtrak’s Northeast Corridor, said the plan will likely “need to be adjusted” to minimize the potential impact on customers throughout Penn Station. The LIRR concourse project is part of a larger modernization of the Western Manhattan transit complex, which includes the ongoing transformation of the Farley Post Office building on Eighth Avenue, across the street from Penn, into the new Moynihan Train Hall, with 700,000 square feet of new commercial, retail and dining space, all connecting to Penn’s tracks and serving Amtrak and LIRR customers. The Moynihan project and the new entrance to the LIRR concourse at Seventh Avenue are both expected to be completed by late next year. The other improvements, including the widening of the LIRR corridor and the raising of the ceiling, are scheduled for completion by early 2022. 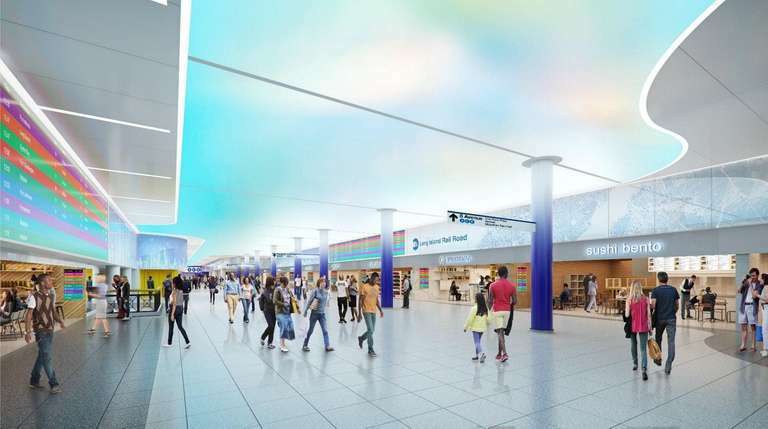 Commuters already have gotten a glimpse at what the re-imagined LIRR concourse may look like. In 2017, the state finished work on the new West End Concourse at the Farley building. The brightly lit space includes access to most of Penn’s Tracks, windows down to the platform level, and digital skylights that create the illusion of blue skies and soft clouds. But rather than usher Penn Station into the future, some advocates have argued for bringing it back to the past. Rebuild Penn Station, a nonprofit organization, has pushed for the restoration of Penn to its original early 20th century design, with its tall, glass, arched ceilings. The major hitch: such a restoration would necessitate knocking down and relocating Madison Square Garden. Samuel Turvey, chairman of Rebuild Penn Station, called the planned improvements at the LIRR concourse “a welcome addition,” but said a more ambitious plan is needed. Beyond the LIRR concourse project, Amtrak and Cuomo have said they are considering several proposals for modernizing Penn, including by hiring a private company to manage all of the station’s concourses, and by knocking down the Hulu Theater at Madison Square Garden to capture more space. Oyster Bay branch commuter Jody Ordioni questioned if all the focus on Penn Station’s “cosmetic” issues was taking attention away from its real problems — constrained and aging infrastructure. “I think there are so many more things — the platforms, themselves, are dangerous beyond belief. And the trains, themselves, are deplorable,” said Ordioni, of Bayville, who believes Penn Station is mostly “fine” as-is. Campbell-Lorenc agreed that addressing Penn Station’s track-level infrastructure needs is “as important or more important” than making upgrades to the building above. To that end, Amtrak has been steadily renewing the station’s 21 tracks and multiple switches since 2017. And it hopes to add new tracks and switches in the future as part of its proposed Gateway megaproject, which includes the construction of a new rail tunnel under the Hudson River. Creates a new pedestrian pavilion entrance at Seventh Avenue and 33rd Street, with three escalators and a stairway leading directly to the LIRR concourse. Widens pedestrian corridor from the current 30 feet to about 57 feet. Raises ceiling by an average of 18 feet. Improves lighting, finishes, ticketing, signage and way finding inside Penn Station. Creates glass walls that will allow customers to look down onto track level from the concourse. Will add more digital information screens with scheduling information and track assignments, including inside stores and restaurants. Cost: Just under $600 million. The LIRR will pay $170 million and the state will fund the rest. The Seventh Avenue entrance is expected to be finished by late 2020, early 2021. The remainder of the project will take until early 2022.